I have a DVD folder of a series that I'd like to convert Video_TS to MP4, so that I may watch it on my Xbox 360. However, each video in the folder has 2 subtitle tracks. I'd like to change these and hardsub the second subtitle track. I'm running OSX 10.8.3 on a MacBook Air (1.8GHz Core i5 + 8GB RAM). Using Mac The Ripper I have ripped a number of my own DVDs onto my HD, now I'm trying to convert Video_TS folder but only get "CSS Encryption, Disc cannot be copied". AFAIK Mac The Ripper was supposed to remove CSS Encryption, but now I have 20+ Video_TS folders that are kind of useless. Is there any way to remove the encryption while it is still a Video_TS folder? Part 1: Which One Can Truly Convert Video_TS to a Single MP4 File? Like the scenarios mentioned above, the conversion from DVD Video_TS to MP4 may be done in vain for a variety of reasons. And here, we will give a thorough solution to convert Video_TS to MP4 with ease via a brilliant DVD ripper for Mac, ready for your diverse needs, whether you want to make your video accessible to portable devices like iPhone, iPad, PSP, Xbox 360, MP4 player, Android tablets and others or you have to edit the video using Final Cut Pro or iMovie. Superior to Handbrake rip DVD or so, this app can quickly read VIDEO_TS.IFO and auto check the right title from 99-title DVD disc, Sony bad sector DVD, Region Code 1-6 DVDs, CSS protected DVDs. If your Video_TS folder is slightly damaged and IFO is out of work, it can auto fix it and read info from VIDEO_TS.BUP. Thoughtfully provide 420+ profiles for you to copy Video_TS content to iPhone Xs/X/8/7/6s/6/Plus, iPad Pro, iPads, Android, game consoles with original resolution and frame rate (480p 29.97fps/576p 25fps). Considering the device you own varies a lot in display size (4.7, 5.5, 5.8, 6.1, 6.2 inch), it enables you to freely crop Video_TS image size to adjust video aspect ratio to fit your display best, removing redundant black borders. 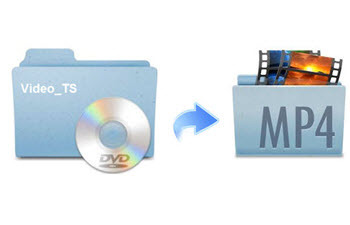 1.2 Let's Convert DVD Video_TS to MP4 File Now! Below given are the step by step instructions. Primarily, you need to free download and run MacX DVD Ripper Pro on your Mac (macOS Mojave) or PC (Windows 10). For those who do the DVD to video conversion task on MacBook or iMac, you ought to prepare an external DVD drive first, SuperDrive or other brands. When everything is ready, you can fire up this DVD ripper to call it begin. Load the Video_TS you'd like to convert by hitting the DVD Folder button on the main interface. Or you can simply drag and drop the Video_TS folder in the program from your computer. Note 1: For the Video_TS folder that is copy protected, the program can automatically choose the right title number from the 99 titles. As for the newly-released encrypted DVDs, it might take a little bit longer to analyze the right title. Alternatively, you can use VLC to play your DVD and remember the right title before loading DVD disc into this tool if the instant analysis is what you care. Note 2: needless to download or install anything like libdvdcss library or VLC player, this DVD to MP4 converter is consantly upgraded to improve its DVD decryption power and DVD analysis algorithm so as to trouble-free handle any DVD (homemade & commercial DRM protected) on its own . Select the format from the drop-down list. Go to the Output Profile Category -> Mac General Video -> MP4 Video. More profiles are available, DVD backup profile, mobile video profile, PC video progile, music audio formats, etc. Step 3: Enable "High Quality Engine" if quality comes at first. Select as many as CPU cores if speed does matter a lot. Better still, Video_TS to MP4 conversion can be hardware accelerated to 5X faster if your computer supports these GPU HW accelerations: Intel QSV, Nvidia or AMD. Hit "Browse" to opt for an output DVD folder. Tap "RUN" to begin to convert DVD to MP4 format at 250-320FPS conversion speed. Part 2: Know More about DVD Video_TS Folder? VIDEO_TS.VOB: VOB is the main part of the data present in DVD, packaging video, audio data, subtitles and other information. VIDEO_TS.IFO: The file stores control and playback information for the entire DVD, e.g info about subtitles, audio tracks, number of volumes, table of titles, etc. VIDEO_TS.BUP: It is the backup copy of Video_TS.IFO file, part of Video Manager. 1.2 How to Play Video_TS File on Mac and Windows? If you need to enjoy Video_TS folder on your computer. Here are two ways for your reference. There are many DVD players that enables to play DVD Video_TS folder on Windows and Mac easily. You can try 5KPlayer, KMPlayer, VLC, or so. Besides utilizing media player to solve the Video_TS playback problem, you can also count on a DVD Ripper that can transcode Video_TS to MP4 or other format playable on Mac QuickTime player or Windows media player. This tutorial teaches you to transcode ISO to MP4 on macOS (Mojave incl.) for playback on iPhone, iPad, Android, etc. with a professional yet easy-to-use ISO to MP4 compressor for Mac. This is a tutorial on how to merge and join DVD episodes into a single one for more convenience in DVD file storage and playback on iPhone Android or Ultra HD TV. 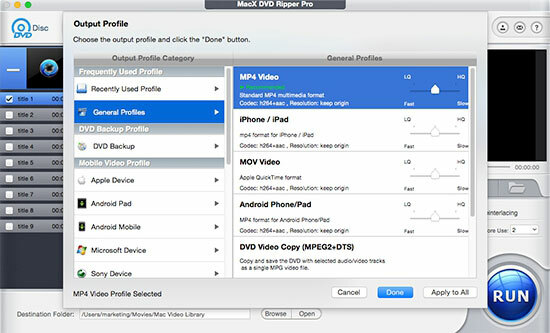 MacX DVD Ripper Pro is the best Video_TS to MP4 converter which can freely convert any Video_TS folder to various video formats (MP4, MOV, MKV, AVI, FLV, etc) and portable devices with original quality.